I’ve read about technology and innovation in post-war Britain, in the form of Empire of the Clouds, A Computer called Leo and Backroom Boys. 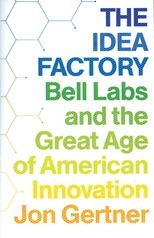 Now I turn to American technology, in the form of The Idea Factory: Bell Labs and the Great Age of American Innovation by Jon Gertner. Bell Laboratories was the research and development arm of the American Telephone and Telegraph Company (AT&T) which held a monopoly position in the US telephone market for over half a century. Bell Labs still exists today as a subsidiary of Alcatel-Lucent but it is much reduced from its former glory. What did they invent at Bell Laboratories? An embarrassment of things: the transistor, the charge-couple device, photovoltaic solar cells, the UNIX operating system, C and C++ programming languages. And they also discovered the cosmic microwave background. They were the main contractor for some of the earliest passive and active communications satellites and the earliest cell phone systems. Claude Shannon worked at Bell Laboratories where he published his paper on information theory, in computing Shannon is pretty much the equal of Turing in terms of influence on the field. If statistics is more your thing, then John Tukey is a Bell Labs alumnus. This is a seriously impressive track record: Bell Laboratories boast 7 Nobel prizes for work done at the laboratory. To get an idea of the scale of this achievement the equivalent figure for Cambridge University is 17, Oxford University 8 and MIT 18. IBM has 5. See for yourself here. I was semi-aware of all of these inventions but hadn’t really absorbed that they were all from Bell Labs. For something over 50 years Bell Laboratories benefitted from a state-mandated monopoly which only came to an end in the mid-eighties. They had argued in the 1920s that they needed a monopoly to build the required infrastructure to connect a (large) nation. In the early days that infrastructure was a system of wires and poles, spanning the country, then cables crossing the ocean, then automatic telephone exchanges first valve based then solid-state. They developed a habit of in depth research, in the early days into improving the longevity of telegraph poles, and the leather belts of line engineers, moving on to solid-state physics after the war. In exchange for their monopoly they were restricted in the areas of business they could enter and obliged to license their patents on generous terms. It’s interesting to compare the development of the vacuum tube as an electronic device with that of the transistor. In both cases the early versions were temperamental, expensive and bulky but through a process of development over many years they became commodity devices. Bell pushed ahead with the development of the solid-state transistor with their optimisation of vacuum tubes as a guide to what was possible. During the Second World War, Bell Laboratories and its staff were heavily involved in the war effort. In particular the development of radar, which to my surprise was a programme 50% larger than the Manhattan Project in cost terms. Bell Laboratories most expensive project was the first electronic switching station, first deployed in 1964. This is a company that strung cables across continents and oceans, launched satellites and the most expensive thing it ever did was build a blockhouse full of electronics! Ultimately the AT&T monopoly gave it huge and assured revenue for a long period, relatively free of government interference. The money flowed from captive telephone customers, not the government and the only requirement from AT&T’s point of view was to ensure government did not break its monopoly. In the UK the fledgling computer industry suffered from a lack of a large “home” market. Whilst the aircraft industry suffered from having an unreliable main market in the form of the UK government. Despite my review which I see makes almost no mention of the people, The Idea Factory is written around people, both the managers and the scientists on the ground. Bell Labs was successful because of the quality of the people it attracted, it sought them out through a personal network spanning the universities of the US. It kept them because they saw they could work in a stimulating and well-funded environment which tolerated sometimes odd behaviour. 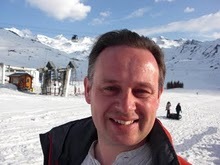 It does bring to mind the central research laboratories of some of the UK’s major companies with which I am familiar, including ICI, Unilever and Courtaulds. Of these only Unilever’s survives, and in much reduced form. The Idea Factory is well-written and engaging, telling an interesting story. It lacks context in what was going on outside Bell Laboratories but then this is not an area it claims to cover.